Truck Facts: 2001 Dodge Ram pick up, 572 ci engine, custer coil-over racing shocks, center mounted race seat. Outstanding Achievements: FOrmer owner/driver Scott Stephens has been racing Monster Trucks since 1980. He was one of the first drivers to create a pair of turbine-powered (aircraft engine) Monster Truck that shot flames out of the hood. They were the Coors Brewser and Coors light Silver Bullet. He also ran his truck under the sponsorship of the Auto Value Parts Stores, calling his truck the Auto Value King Krunch. 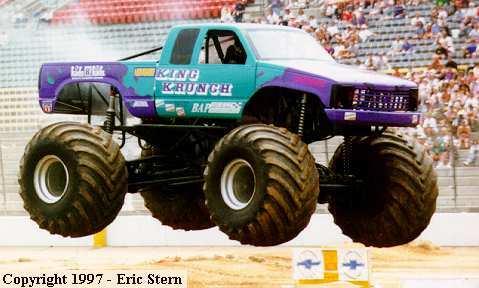 King Krunch placed 7th in the 1988 and 1989 TNT Renegades Monster Truck Challenge Series. Scott's crew was also voted 1989 Monster Truck Team of the Year.